Just for today, 12/15/15, my Easy Hand Lettering class is on sale for $15! This class will teach you the foundations of hand lettering with a fill line, along with an easy trick for making the fill line faster. The class includes over three hours of video and written instruction. No special supplies are needed: just paper and a pencil! After recently learning brush lettering, I have been posting a bit of it on my social media and I keep getting asked questions about what pens I'm using. To answer these questions, I decided to add a 30 minute video to my lettering class and share the secret of what finally helped me have a breakthrough to learning brush lettering, after 10 years of trying. 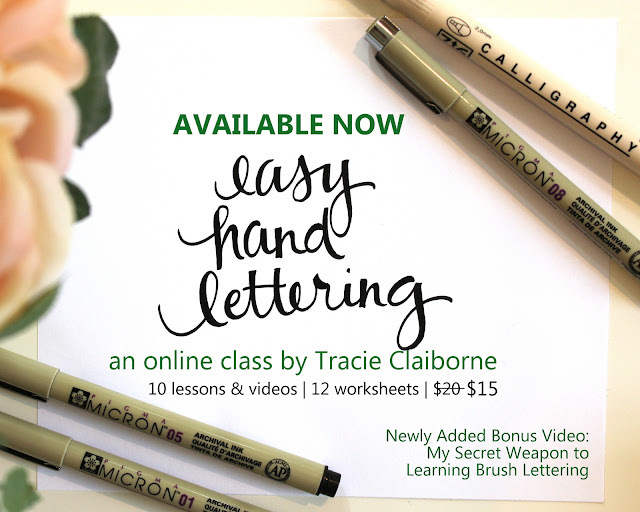 If you're among the hundreds of people who have already purchased the class, you can access this video by visiting the link you received to the classroom and clicking on the lesson called "Bonus: Brush Lettering." Is there a way to check and see if I have already purchased this class at an earlier time? I know I purchased one way back in the late spring/early summer when we were in the midst of moving. I had it pulled up on my computer and then somehow one day it was gone and I couldn't remember the title of it or anything. I would greatly appreciate it!!! My name is Jennifer Johnson if that helps to find it! I would like to purchase your class at the discounted rate, but I don't use Paypal. Is it possible to pay through a Visa Gift Card? So excited! Figured out the transaction and now I"m signed up for your hand-lettering class. Thank you for the sale!